The Himalayan Snowcock feeds on plant matter such as rushes, tubers, leaves, young shoots, berries (Ephedra) and grasses (Poa, Alopecurus). During winter, it also takes the seeding grass-heads of a rye-like grass (Lolium). It forages by walking slowly while picking up the vegetal food items. It may travel long distances for feeding, up to one square km per day. The Himalayan Snowcock has large range where this bird is widespread. This species occurs in undisturbed areas high in mountains. In some places, it is hunted for food. However, the populations are stable. The introduced population in Nevada gather between 200 and 500 birds established in the Ruby Mountains. This species is not currently threatened, and evaluated as Least Concern by Birdlife International. The Himalayan Snowcock can be a noisy bird. This is a mountain species which favours cliff ledges and steep slopes. Its cryptic plumage provides him a good camouflage among rocks and boulders. The adult male is similar to a large grey tan partridge. Rump and tail are grey. Upperwing and back are grey with chestnut-edged feathers. The mantle is slightly paler grey. The white tipped-black primaries are visible in flight, as the rufous outer tail feathers. On the underparts, the breast is pale buffy-grey with horizontal blackish streaking. Belly and vent are darker grey-brown with dark rufous-brown band from behind the eye, extending onto the neck and forming a collar at base of the white throat. A dark moustachial stripe extends down to the hindneck and joins the collar. The bill is dark grey. The eyes are brown surrounded by yellowish orbital skin. Legs and feet are dark orange-yellow. The male has tarsal spurs. The female is slightly smaller than male and lacks the spurs. She has pale buff forehead and greyer eye area. She is paler than male overall but shows the same plumage pattern. The immature is paler with less distinct markings, but the white supercilium is conspicuous. We can find five subspecies which differ in tone of plumage. The nominate race here described and displayed is the darkest. The Himalayan Snowcock’s typical calls include a variety of whistles, cackles and chuckles. But this shy bird is more often heard than seen. The whistles are melodious and a cry can be heard too. The Himalayan Snowcock frequents high, open, steep mountain slopes, from the tree-line up to the snow-line. It is usually seen in alpine pastures and rocky ridges. It also frequents steep valleys and mountain spurs at very high elevation. This species can be seen between 3600/3900 metres up to 4600 metres of elevation in Pakistan. The Himalayan Snowcock is native of Asia, including India, Nepal, Pakistan and Tibet. It is found in the mountains of C and S Asia. 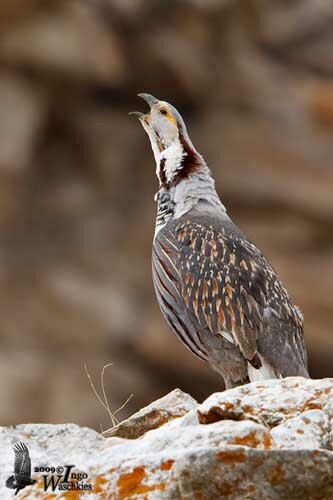 The species has been introduced to the Ruby Mountains in Nevada – USA, as gamebird, with birds coming from Pakistan. The Himalayan Snowcock feeds mainly on plant matter. During the summer, it feeds on grasses and sedges, shoots and leaves, tubers, rushes and berries. During the winter, it forages for vegetable food over the exposed slopes where the snow does not persist. The food items are fairly similar all year round, with addition of seeding grass heads. They forage by digging with their strong bill, and by racking the ground with the feet. They forage while walking slowly up hill. Once at top, they take flight to reach another ridge. They occur in steep areas all year round, but in summer, they are higher towards the top of the rocky ridges, whereas during winter, they frequent the cliffs, slightly lower but always in very steep areas. Outside the breeding season, they can be seen in flocks of 15-20 birds. 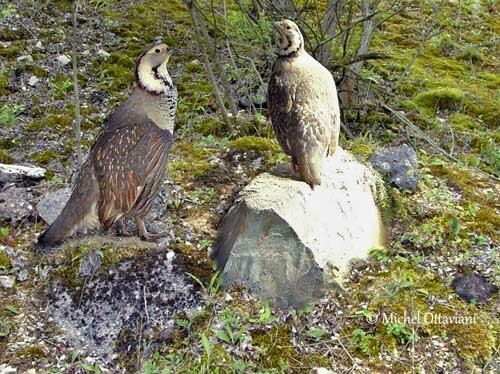 During the breeding season, the male performs courtship displays. It crouches down to the ground while the wings are slightly fanned, the tail feathers dropped and the plumage slightly ruffled. Then, it moves in front of the female, circling, or running back and forth repeatedly. These movements enhance the plumage pattern of the male while displaying close to the hen. Several loud whistles of five notes accompany these displays. The Himalayan Snowcock does not migrate, but it performs altitudinal movements in order to spend the winter at lower elevation. In Nevada – USA, they remain above 3000 metres throughout winter. The Himalayan Snowcock does not fly frequently and often prefers walking or running if disturbed. But when it does take flight, it jumps down from a ridge or a cliff ledge, and usually flies close to the ground. The laying occurs from late April to mid-May. 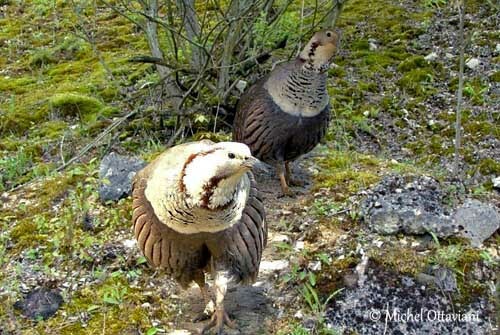 The Himalayan Snowcock is monogamous and the pair only produces one brood per year. The nest is on the ground. This is a depression lined with dry grasses and feathers, situated amongst tussocks of grass, and often protected by rock or boulder, or in caves. The female lays 6-12 eggs, usually 8 ones. The incubation lasts 25-28 days, shared by both sexes, but the female does most of the incubation. Both adults raise the precocial chicks until they fledge. They often remain with their parents until they are able to mate.